A trendy Beacon Hill crowd starts to arrive at the Liberty Hotel lobby. You grab a drink from the lobby bar—perhaps a Juniper Blossom, made of Tanqueray, St. Germain, and grapefruit—and look out onto the soaring four-story atrium. The grand space is marked with towering arched windows, wrought-iron chandeliers, and mahogany furniture. If you didn’t know, you might never guess that the place was once a jail. Yes, until the 1990s, the hotel was the old Charles Street Jail, which housed inmates such as Sacco and Vanzetti and James Michael Curley (who was imprisoned there for fraud but ran a successful campaign for alderman while he was interred). Developer Carpenter and Company and architect Cambridge Seven Associates teamed up to repurpose the property. The old cellblocks are now stylish catwalks with sitting areas for guests, the original “drunk tank” has (fittingly) been turned into a bar, and some of the original jail cells are now dining nooks at the on-site restaurants. Eighteen of the 298 guest rooms also are set up within the landmark jail building (with the rest in a newly constructed 16-story tower). While there are many nods to the Liberty Hotel’s history, thankfully, there’s nothing prison-like about the guest accommodations. Spa-like is more apt, with luxurious bathrooms with separate deep bathtubs and rainfall showerheads. 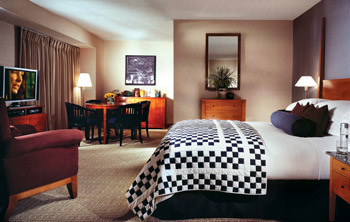 And, with a spot right at the foot of the Longfellow Bridge, many of these rooms look out over the Charles River. Harvard Square teems with activity. Students crowd coffee shops in the morning and grab beers in bars at night. Bargain-hunters rummage trough bookstores and vintage shops. Couples on dates share falafel sandwiches and sample tacos in the neighborhood’s surfeit of restaurants. Culture-vultures take in an indie film at the Brattle Theatre (617-876-6837, brattlefilm.org) or a performance by the American Repertory Theatre (617-547-8300, amrep.org). It seems as if The Charles Hotel isn’t just well positioned to take advantage of the life of the neighborhood—it is part of the life of the neighborhood. 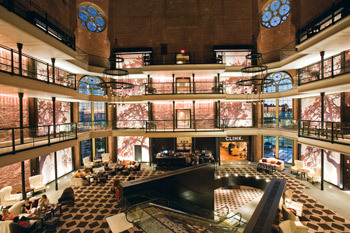 The hotel’s Regattabar is regarded as one of the best jazz clubs in Boston. (The 26-year-old club has won Boston magazine’s “Best of Boston” award no less than 14 times.) Its Noir, a 1940s-style bar serving classic cocktails like the Mai Tai and the Old Fashioned, was recognized as having the “Best Nightlife” by Food & Wine magazine, and revelers spill from inside to outside on warm nights. Even the courtyard at the entrance to the hotel, which abuts the Kennedy School of Government, is a happening spot for community events, hosting everything from a weekly farmers’ market in warm-weather months to an ice-skating rink in the winter.